New chemistries offering higher energy density and lower prices will lead to exponential growth in the worldwide capacity of next-generation advanced batteries. 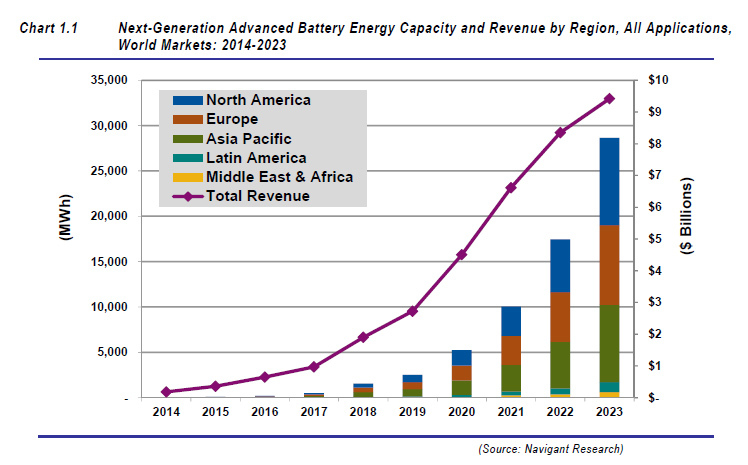 A report from Navigant Research analyses the global market for next-generation advanced batteries, focusing on the current leading battery chemistry – lithium ion – and the energy storage device types that might eventually replace it. While lithium ion (Li-ion) batteries offer many advantages over traditional battery technologies, research and development of new battery chemistries that, in many ways, surpass Li-ion is advancing rapidly and is expected to have a major impact on the battery industry in the coming years. These new chemistries are anticipated to enable even more applications for batteries, thus increasing the overall size of the market. According to Navigant, total worldwide capacity of advanced batteries is expected to grow from 30.4 megawatt-hours (MWh) in 2014 to more than 28,000 MWh in 2023. New emerging battery types include ultracapacitors, lithium sulfur, magnesium ion, solid electrolyte, next-generation flow, and metal-air. Their advent is occurring alongside an enormous growth in the world’s appetite for advanced energy storage devices. Increasingly, this will include electric vehicles and localised home energy storage, e.g. from rooftop solar. The report, “Next-Generation Advanced Batteries”, offers detailed analysis of the market issues and battery landscape associated with next-generation advanced batteries. Global market forecasts for energy capacity, power capacity, and revenue, segmented by region, application, and chemistry, extend through 2023. The report also examines the key imminent and emerging technologies related to advanced batteries and provides in-depth profiles of the major industry players. An Executive Summary is available as a free download.